1Mid-America Thoracic and Cardiovascular Surgeons, The University of Kansas Medical Center, Kansas City, USA; 2Department of Pharmacy Practice, School of Pharmacy, The University of Kansas Medical Center, Kansas City, USA; 3Cardiovascular Division, Department of Internal Medicine, School of Medicine, The University of Kansas Medical Center, Kansas City, USA; 4Cardiovascular Research Institute, The University of Kansas Medical Center, Kansas City, USA; 5Department of Biostatistics, School of Medicine, The University of Kansas Medical Center, Kansas City, USA. Background: Sustained positive outcomes after coronary artery bypass grafting (CABG) requires risk factor modification and secondary prevention medications. Much attention has been focused on planning at hospital discharge; however longer-term patient compliance is not well described. Hypothesis: A follow-up multidisciplinary educational program improves disease understanding, motivation to reduce cardiovascular risk, and secondary prevention medication prescribing following hospital discharge. Methods: Using a prospective, randomized, controlled design, patients undergoing CABG completed surveys over a year period, assessing disease understanding and motivation. Four to six weeks after CABG, intervention subjects completed a one-time educational program with a multidisciplinary team. The primary endpoint was a composite score of reduced risk factors, medication use, and awareness of prescribed medications. Secondary endpoints evaluated survey scores and medication use rates. Wilcoxon Rank Sum and Chi Square tests compared data between specific time points. Generalized estimating equations and linear contrasts of the parameter estimates compared data at the three time points. Results: The final analysis included 98 subjects (Intervention = 49, Control = 49). The composite score was not different between groups (I = 12.8 ± 4.5 points, C = 12.7 ± 4.9 points, p = 0.9405). Improvements were noted in understanding and motivation in the entire cohort, but these changes were not influenced by the intervention. Medication prescribing declined at 3 and 12 months after CABG without significant differences between the groups. Conclusions: Disease understanding, motivation to reduce risk, and medication use are robust at hospital discharge but the latter declines with time and was not improved by our intervention. These findings are concerning and warrant further study. Advances in surgical techniques have resulted in excellent postoperative outcomes from coronary artery bypass grafting (CABG) operations, despite the high acuity of patients in the current era [1,2]. Since coronary artery disease (CAD) is a chronic, progressive illness, optimal postoperative treatment of these patients should include preventive measures that have been demonstrated to limit future cardiovascular events, subsequent need for interventions, and improve outcomes [3-5]. Since an optimal prevention regimen is critical to achieving long-term success, systems of care should adopt integrative and multidisciplinary methodologies to assure that patients receive an ongoing benefit from CABG operations, with early initiation after the surgical procedure . Previous studies have documented that patient compliance with secondary prevention regimens after CABG has often been inadequate, especially in relation to the four major drug classes that have been shown to be particularly efficacious (platelet inhibitors, beta blockers, lipid-lowering agents, and angiotensin converting enzyme inhibitors (ACEIs) or angiotensin II receptor blockers (ARBs) [7-13]. 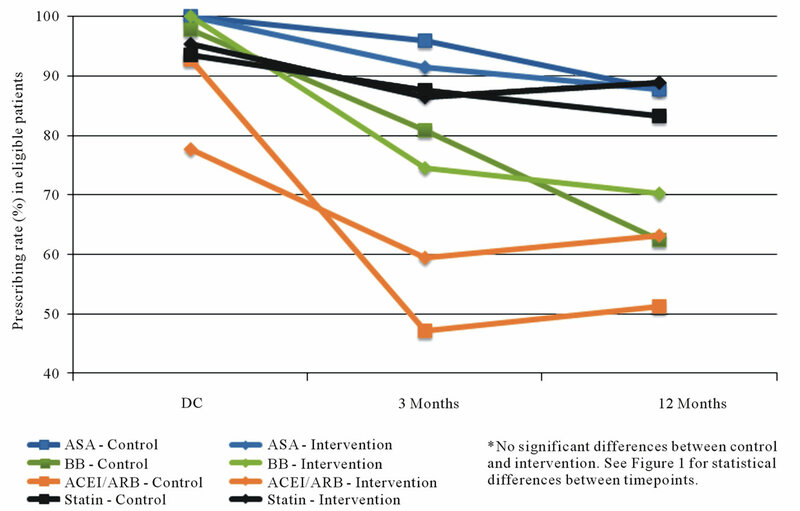 Recently, a large multicenter trial, utilizing patients included in the Society of Thoracic Surgeons (STS) database, showed that local “low-intensity” continuous quality improvement protocols designed to reinforce preventive strategies were very effective at assuring that postoperative patients were discharged from the hospital on an appropriate drug regimen . It remains unclear if efforts focused solely on the time of hospital discharge are sufficient to affect longer-term compliance with these important measures . The objective of this randomized, controlled study was to assess the influence of a multidisciplinary follow-up educational program on disease understanding, motivation to reduce cardiovascular risk, and secondary prevention medication prescribing following CABG. Between January 2008 and January 2009, patients who underwent CABG at our institution were offered inclusion in this secondary prevention study. Patients who accepted entrance into the study and completed the entire program comprise the subject of this analysis. The study was approved by our Institutional Review Board and each patient gave informed consent. As standard care, all patients received instruction by teams of specialists during the postoperative recovery phase prior to hospital discharge. This included the inpatient cardiac rehabilitation team that stressed the importance of prevention, specifically physical activity. Additionally, each patient was counseled by a dietician and every patient who reported a tobacco use history was provided smoking cessation counseling. The cardiac surgical team, specifically physician assistants, was charged with prescribing indicated preventive medications (antiplatelet agents, statins, beta blockers, and ACEI/ARBs) prior to hospital discharge if the patient was eligible for the medication. During the postoperative period, we randomized subjects to an intervention or control (“usual care”) group using a computer generated randomization scheme and sealed envelopes. Hypothesizing that hospital discharge might not be the optimal time to deliver an educational message to anxious postoperative patients and their families; we examined the effects of an additional educational intervention 4 - 6 weeks following the hospitalization. This intervention, conducted by a multidisciplinary team consisting of a pharmacist, dietician, and cardiac rehabilitation nurse, was designed to be an educational “booster” to reinforce the importance of secondary prevention, answer patient questions or concerns, and thereby increase understanding of evidence-based methods of prevention. The “booster” consisted of a 3 hour intervention that included a general information group session accompanied by individually-tailored 30 minute meetings with 3 individual clinicians: each discipline was represented by 1 or 2 trained individuals throughout the study time period and discussions were initially scripted to attain the most consistency possible. None of the professional participants in the “booster” were involved in the patient selection, follow-up, data analysis, or overall conduct of the study. A plan of care was formulated and given in writing to the patient, his/her cardiologist and their primary care physician. No medication changes were ordered during the “booster”, but rather modifications were suggested to the referring physicians so that appropriate follow up and monitoring could be completed. Family participation was strongly encouraged during the “booster” sessions in order to enhance the quality of the interaction between the patient and the individual specialists. 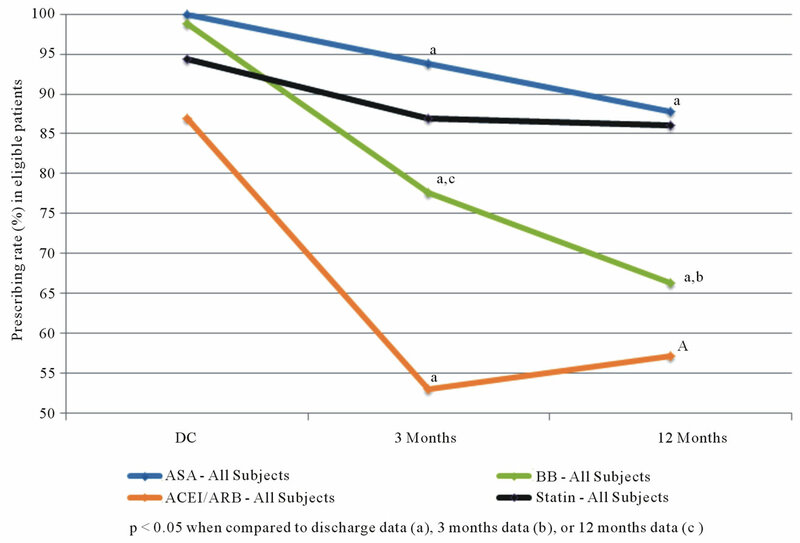 Data were collected by study coordinators at 3 distinct time points: hospital discharge (DC), and then at the 3 and 12 month intervals following hospital discharge. Demographics, clinical parameters, and medication-use data were obtained from the hospital’s electronic medical record and outpatient clinic records. The electronic medical record was used to determine medication use rates at the three study time points and was compared between the groups. Medication use is reported as percent use among those eligible to receive the therapy. Eligibility was determined by the variables provided in Box 1. For medication use data, note that patients might have relative contraindications at the baseline time point (hospital discharge), that no longer existed at the 3 and 12 month time periods (for example, hypotension). Thus, more patients were considered eligible at the 3 and 12 month time points. In order to comprehensively assess the efficacy of the “booster” intervention, we devised a Composite Heart Health Index (CHHI), which took into account improvement in risk factor parameters, indicated medication use, the patient’s awareness regarding their disease and prescribed medications. The variables used to calculate the score are presented in Table 1. Points were awarded when improvement was shown in risk factors (such as smoking status, body mass index, lipid levels, and blood pressure) between the time intervals. Points were also awarded when patients could correctly identify if they were or were not taking specific medications for secondary prevention. 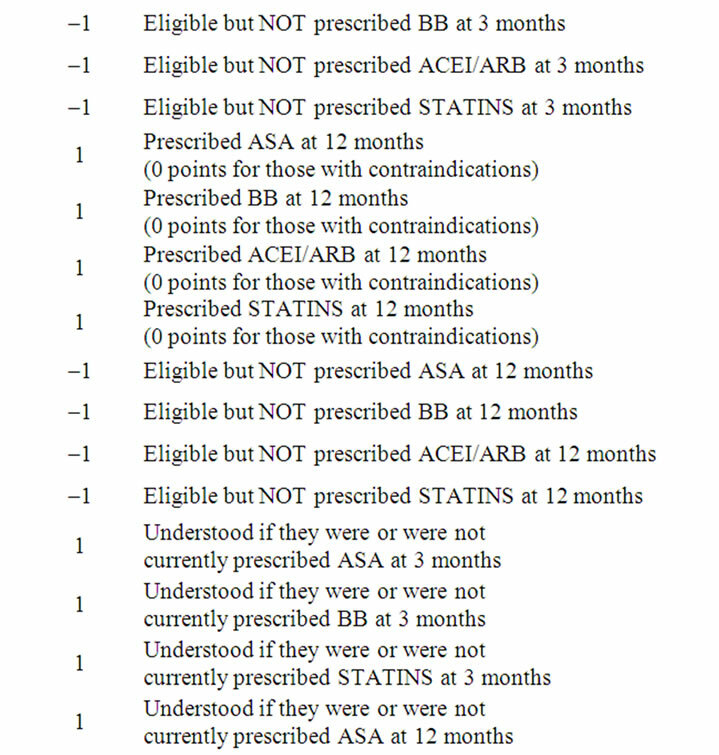 Points were deducted however when these medications were not prescribed to eligible patients. Scores from a 15 question “understanding” survey and a 6 question “motivation” survey were assessed. Box 1. Indications and contraindications to secondary prevention medications after coronary artery bypass graft surgery (CABG). 100 to obtain a survey score for both the understanding and motivation surveys. Table 1. Calculation of the Composite Heart Health Index (possible range –8 to 26 points). time points were compared between the groups using a Wilcoxon Rank Sum test. Differences between medication use at specific time points, and other categorical data were compared with Chi square or Fisher’s exact tests. To compare the statistically dependent understanding and motivation survey scores at the different time points we used generalized estimating equations (GEE), to account for the correlated responses from the same subjects. Linear contrasts of the parameter estimates were performed to do pairwise comparisons between the three time points using Wald chi square tests. Alpha was set a priori at 0.05. During the study period 118 subjects (ages 42 to 86 year old) were screened, offered admission, and eventually consented to participate in this research project. 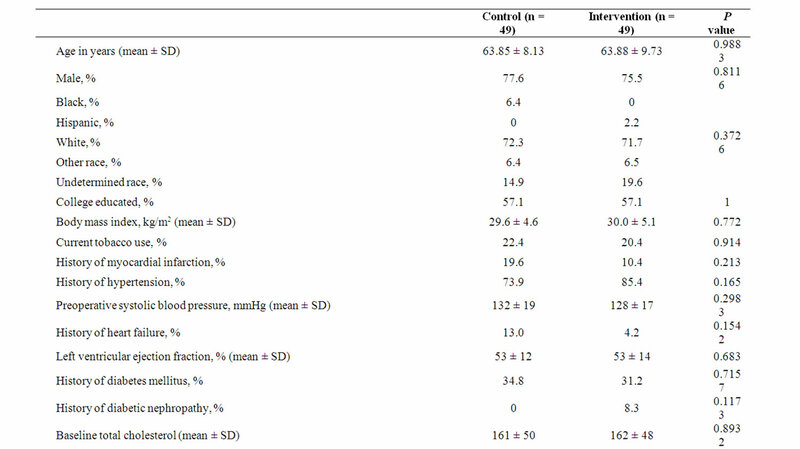 These patients were randomized into the “usual care” and intervention (“booster”) groups. Patients who were unable or unwilling to complete the 3 surveys were dropped from the study. Of the original group of 118, 98 (49 in each group) ultimately completed the baseline, 3 month, and 12 month surveys, and thus were included in the final data analyses. Table 2 summarizes the study population’s demographics. In order to assess the effectiveness of our intervention, we evaluated the mean Composite Heart Health Index (CHHI) score between groups. The CHHI was not different at the 12 month time point between the groups (intervention 12.8 ± 4.5 points vs control 12.7 ± 4.9 points, p = 0.9405). Figure 1 illustrates the changes in usage by eligible candidates for the four classes of prevention medications for the entire cohort. The prescription rate at discharge is high in all four groups ranging from 87% for ACEIs/ ARBs to 100% for antiplatelet agents. However there are significant declines in medication utilization rates for 3 of the 4 classes with time, first at 3 months and further at 12 months. 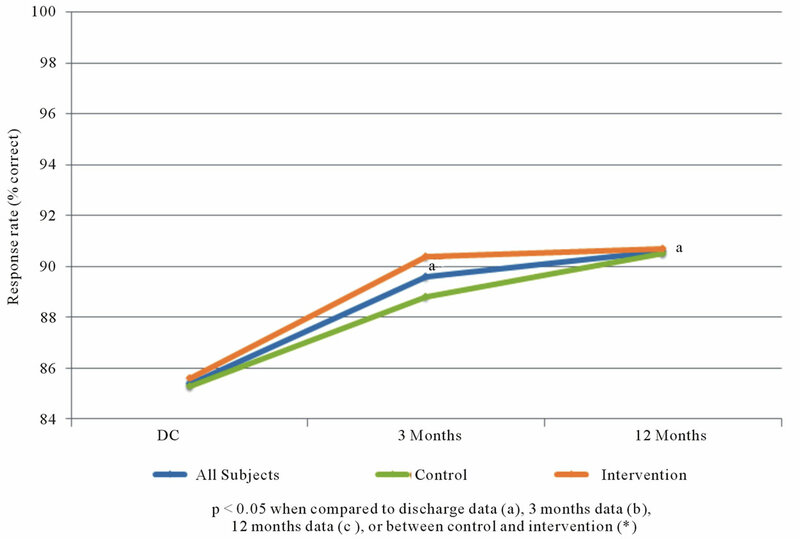 There was not a significant difference between the control and intervention subjects, as shown in Figure 2. Figure 3 suggests that there is a high rate of basic understanding about CAD, which is present at the time of discharge (after the standard patient education given to all patients), and improves significantly over time. 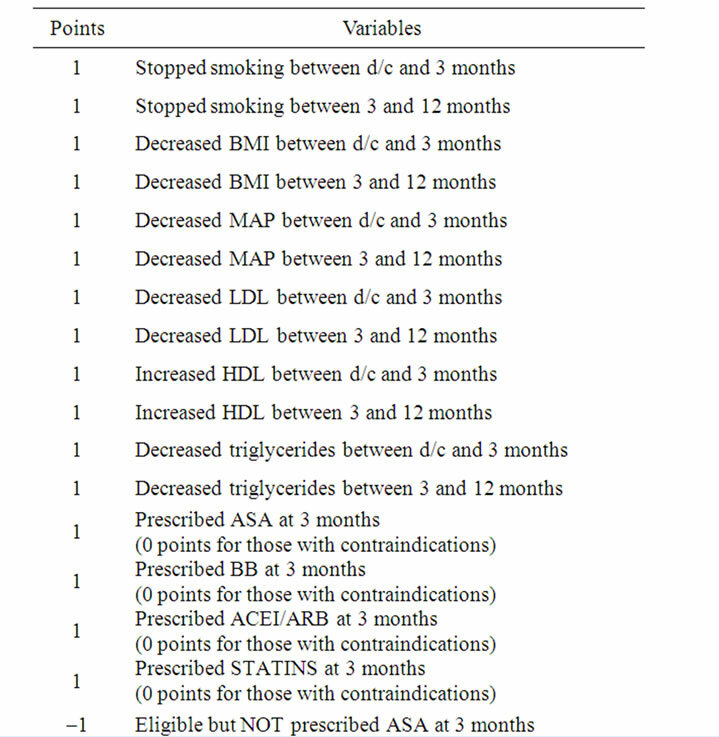 Significant increases in “motivation” to reduce cardiovascular risk from baseline (hospital discharge) to the 3 and 12 month time periods were noted (see Figure 4). However, there were not significant differences between the control and intervention groups with respect to the survey results. Coronary bypass operations represent an opportunity to reinforce the necessity for CAD prevention in patients with severe disease . Previous efforts have predominantly focused on hospital discharge as the optimal time to educate patients and establish a preventive regimen. However, our study suggests that this alone is not sufficient for sustaining longer-term compliance with the preventive regimen. The current study, documents a clear deficiency in our present approach to secondary prevention following CABG. Use of 3 of the 4 major classes of preventive drugs (ASA, beta blockers, and ACEIs/ARBs) declined significantly over time. Despite the fact that several studies have documented sub-optimal compliance with secondary prevention medications following CABG, only a few have examined patterns of use in the longer term. Goyal and colleagues found that patients taking half or less of the indicated preventive medications suffered significantly higher rates of death or myocardial infarction at 2 years following CABG . However, they did not show a significant decrement in the utilization of indicated medications over time. In this particular study only 65% of eligible patients were taking all 4 of the suggested classes of medications, and very few changes were made before the one year mark. 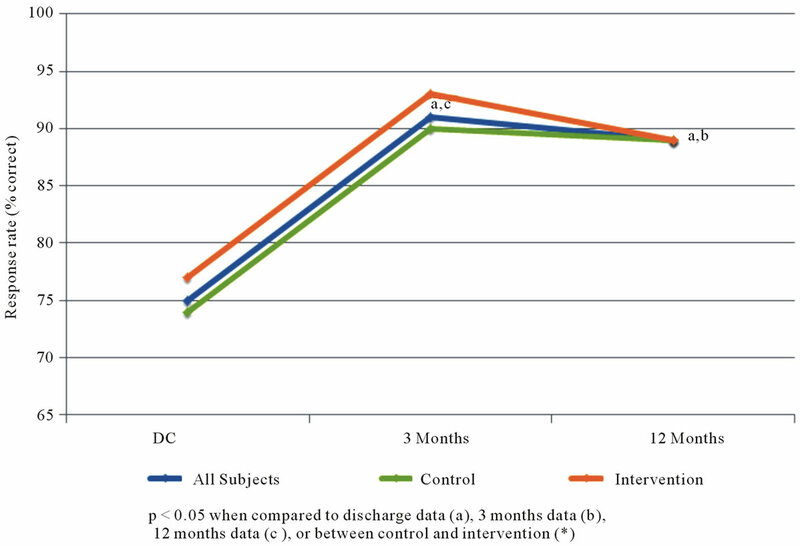 Okrainec and colleagues demonstrated no change in compliance with preventive medications from the time of hospital discharge to the one year follow up time . The reasons for the discrepancy between these studies are our results are possibly explained by our high rate of baseline (hospital discharge) medication usage. Additionally, patients with medication contraindications at the time of hospital discharge no longer possessed these contraindications at 3 and 12 months postoperatively. This raises the number of “eligible” recipients at these time points. Physicians caring for post-CABG patients need to routinely screen for non-prescribed preventive medications and initiate therapy when contraindications are no longer present. Figure 1. 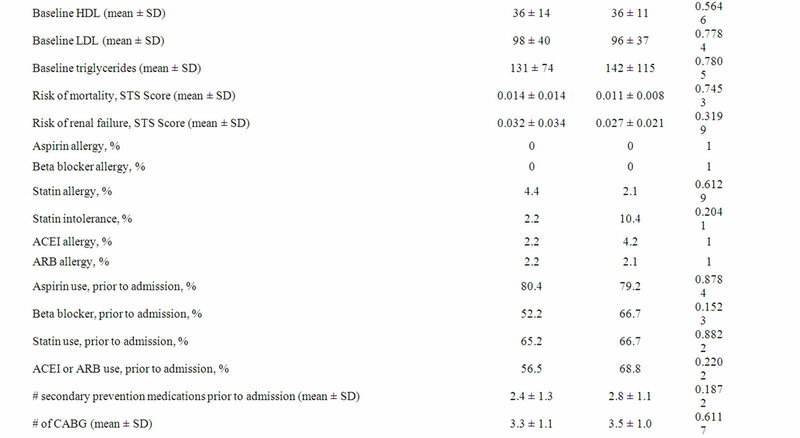 Secondary prevention medication use among eligible patients undergoing CABG (all subjects). Figure 2. Secondary prevention medication use among eligible patients undergoing CABG (by study group). Figure 3. Percent of subject responses suggesting positive understanding of coronary artery disease. Figure 4. Percent of subject responses suggesting positive motivation to reduce cardiovascular risk. that there are many factors impacting compliance with evidence-based guidelines, knowledge and motivation being only two. Our results indicate that patients do seem to acquire significant knowledge about CAD after the CABG experience, a finding that supports the effectiveness of our existing “usual care” protocols. Moreover, this enhanced knowledge seems to be well maintained up to a year after the operation. Patients also seem to be highly motivated to make changes necessary to maintain good cardiovascular health at the 3 and 12 months time points following CABG surgery. If patients are more knowledgeable and better intentioned to comply with long-term preventive measures in the perioperative period, why do rates of medication compliance decline over time? We incorrectly hypothesized that a later educational “booster”, given during the follow up period several weeks after hospital discharge would be an effective way of maintaining the patients’ compliance with preventive measures. However, patients cannot take appropriate medications unless their individual physicians identify the indications for therapy and prescribe appropriately. Moreover, our interaction with patients suggests that the majority are not comfortable asking the physiccian to prescribe certain medications; thus it is incumbent upon the prescriber to provide appropriate follow-up and medication adjustments over time. Even though our educational interventions were very well-received by patients and their families who participated, clearly more than a single early educational “booster” is necessary to reach the goal of optimal longterm compliance with prevention protocols. The answer to long-term compliance may reside in an ongoing program of interaction between the patient and healthcare providers to constantly reinforce goals and maintain a preventive regimen. While in the present study, we did communicate our recommendations (in writing) to each patient’s cardiologist and primary care physician following the intervention; there is no evidence that this affected prescribing behavior. Further attempts to improve utilization and compliance with evidence-based regimens must be directed at bringing primary providers and patients together such that both groups are fully aware of what specifically is required to reduce the risks of further cardiovascular events following CABG, and to provide a structured system to monitor and augment this process. An important consideration is the longitudinal comparisons in our study only involved assessment of prescribing, but not adherence to, the four classes of preventive cardiovascular drugs. While not validated, our survey questions were designed to assess patients’ basic understanding of their disease, medications, and motivation to improve their risk of future disease. Subsequent investigations might consider utilizing validated surveys to improve study generalizability. Certainly our interventions, both pre-discharge and the additional “booster” did emphasize the importance of comprehensive risk factor modification, taking into account all of these factors. Future efforts should focus more specifically on these issues, since they are important components to a riskreduction strategy . Another limitation of this pilot study was the fact that it was primarily directed at the patient, although a crucial role in prevention is in fact played by his/her physician. Even though there was an attempt to engage the referring physicians in the process, in the form of a written “action plan” developed by the booster team, coordination for follow-up will need to be more thorough in the future to maximize effectiveness of the preventive regimen. Efforts directed at establishing secondary prevention plans for postoperative CABG patients are important, but should not be restricted to the time point of hospital discharge alone or a single early follow-up intervention. There is a significant drop-off of secondary prevention medication prescribing rates to eligible patients over time. This drop-off does not seem to be related to deficiencies in either patient knowledge regarding CAD or motivation to follow established guidelines and lifestyle modification. Ongoing educational strategies, screening for nonprescribed secondary prevention medications, and regular follow up must be incorporated to impact long-term patient outcomes. Additionally, there is a clear need for better systems to insure continuity of care as patients transition from the surgical teams back to primary care in order to improve evidence-based care. The authors would like to thank the following individuals for the contributions they made to this study: Donita Atkins, RN, Warren Chen, MD, Laura Knippa, RN, Eric Larson, MS, Shannon McCabe, BS, Caroline Murray, BS, Jennifer Staley, RN, Lisa Watkins, BS, and Kara Wheeler, MS, RD, LD. Drs. Kramer, Howard, Barnes, Muehlebach, and Vacek received a grant from the Menorah Legacy Foundation (Kansas City, Missouri) and the University of Kansas Hospital to support this research. The study authors remained in full control of the study design, methods used, outcome parameters, analyses of data, and production of the written report. For the remaining authors no conflicts are declared. All authors have read and approved the manuscript as written, attest to the validity of the results, and meet the ICJME criteria for authorship. This work was presented in part at the American Heart Association QCOR Meeting, May 2012.